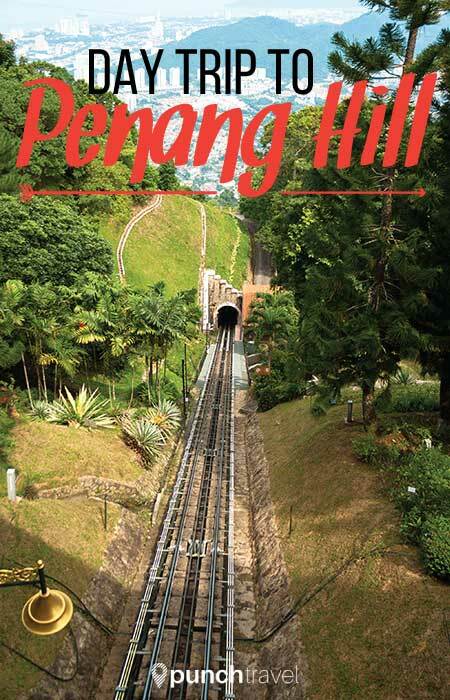 Going to the top of Penang Hill is one of those things you just have to do when you go to Penang. Like the Empire State Building is to New York City, or the Eiffel Tower is to Paris, Penang Hill is Penang’s must-see tourist attraction. 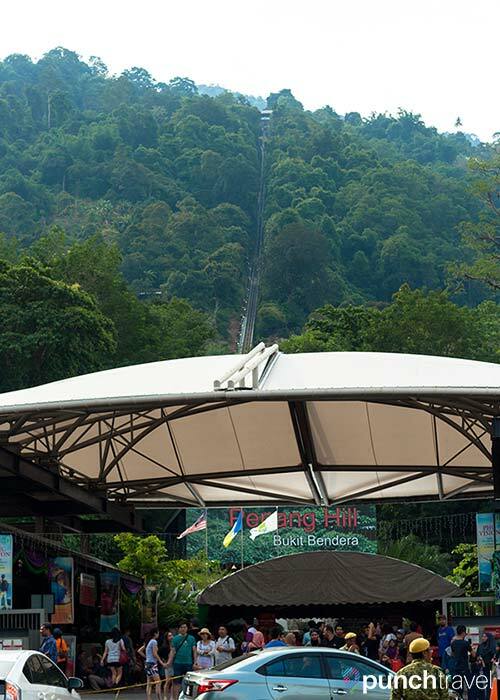 Also known as Bukit Bendera, Penang Hill is a popular attraction for locals and tourists alike to escape the heat of the city and take in the panoramic views. To get to Penang Hill, we took the public bus from Komtar Sentral. The bus ride cost RM 2 and took about 40 minutes from Prangin Mall in George Town. The bus dropped us off right in front of the entrance to the Penang Hill cable car. Ticket counters segregate Malaysians and Non-Malaysians. Unfortunately the prices are also segregated. A roundtrip ticket for foreigners costs RM 30, three times the Malaysian ticket price. There is also a fast-lane option available for RM 60. Figuring we were in no hurry, we opted for the normal ticket price. In hindsight, we should have seriously considered the fast-lane option. With our tickets in hand, we first entered a stuffy where we waited like cattle waiting for the slaughter. The room is actually the overflow room, because we were then corralled into lines reminiscent of the airport security line. At least it was in a covered area outside that allowed for a slight breeze. After waiting more than an hour, we finally made it to the funicular train car. Part of the reason why the wait is so long is because there are only two trains: one going up and one going down. The cars are on a single cable and act as counterweights to bring the train car up or down. The other part of the reason why the wait was so long was because it was a Saturday. And also a holiday weekend. Trains run every 15 minutes during peak times, and otherwise every 30 minutes. Each train fits about 80 passengers each. It felt like we were waiting to get on a ride at Disneyland. How many in your party? Two? Okay you two can come in. We squeezed into a packed car fitted with a few benches but for most of us it was standing room only. The ride whizzed us through the jungle before arriving at the upper station, 735 meters above sea level. Along the way, we passed intermediate stations that serve the 1,000 or so people living on the hill. Once at the top we were rewarded with a spectacular view of Penang below. It was hazy when we visited but we could still see the sea and city below. 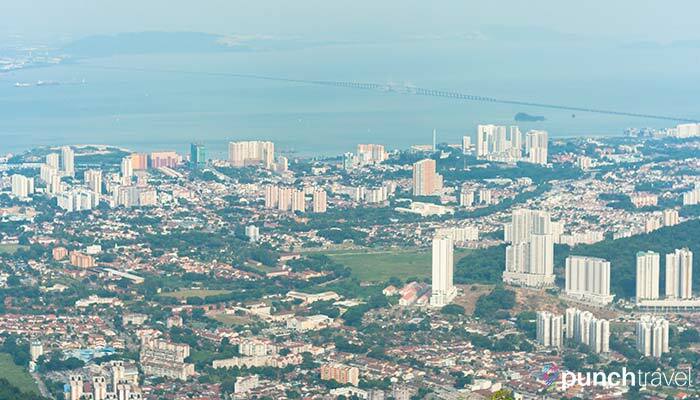 Several scenic viewpoints are marked with a sign picturing the Penang landscape and landmarks. Timing a visit around sunset could be a romantic and photo-worthy option. There are several activities at the top of the hill. 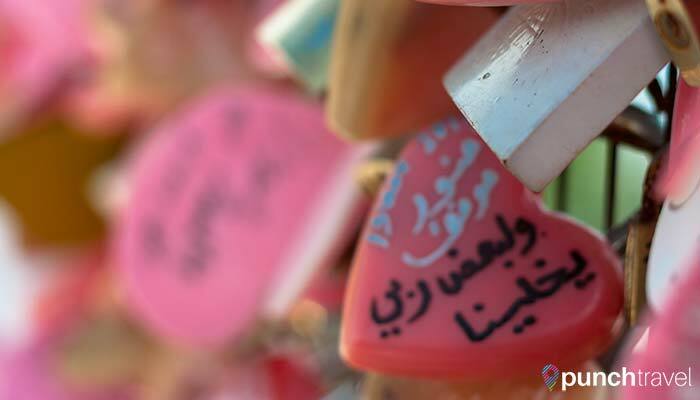 Some are more touristy, like taking a photo with exotic animals or attaching a love lock to the fence. A recently opened owl museum contains owl-related artwork and crafts. There is also the Penang Toy Museum Heritage Garden, which displays 120,000 toys and 110 life-size figures of movie, comic and video game characters. For a less touristy option, we walked a little further up to check out the mosque and Hindu temple. 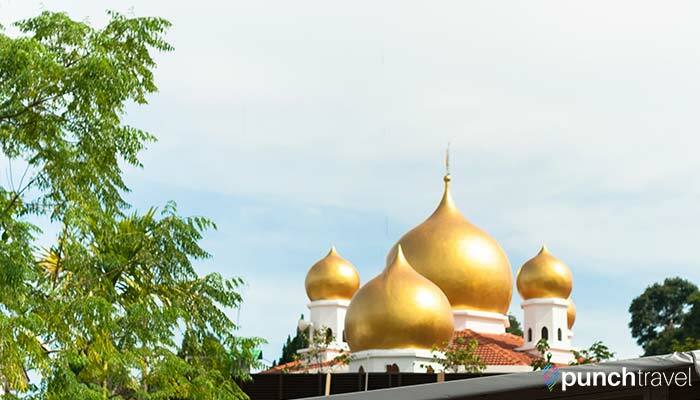 Both the mosque and the temple are in active use, but visitors are welcome. Behind the mosque is a brick gatehouse with an arched entrance that leads to the entrance of a government bungalow called Bel Retiro. It was built in the early 19th century as a resort for high-ranking government officials and visiting dignitaries. The bungalow itself is closed to the public but the gatehouse is free to explore. A beautiful hotel at the peak of the hill was used as a filming location for the award-winning 1992 French film, Indochine. There is a food court at the top of the hill, where we searched in vain for a pirouli. While there were no freezer pops to be found, there was a giant mango ice cream that looked quite tasty. The food court mostly sells Malaysian food but also a few Western options. Outside, food carts line the pathway selling snacks and sweets like the popular coconut ice cream. After about two hours exploring the top of Penang Hill, we returned to the upper hill trains station to ride back down. Luckily the wait time to go down was much less than the wait time to go up. 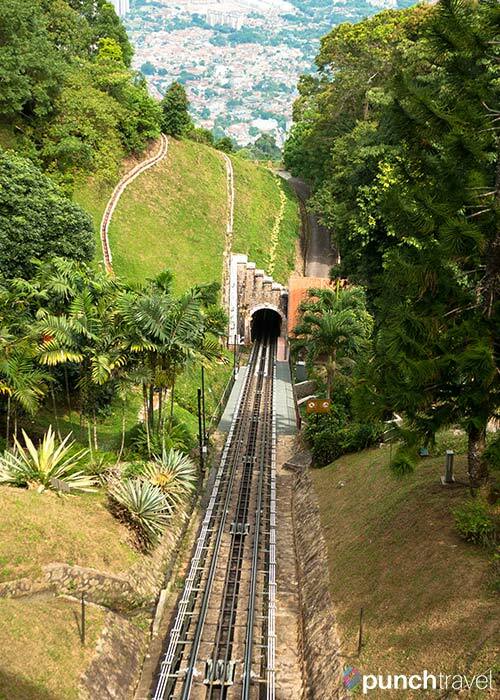 Seeing the views from the top of Penang Hill is definitely a unique experience to do when visiting Penang. But prepare for a long wait to board the cable car. 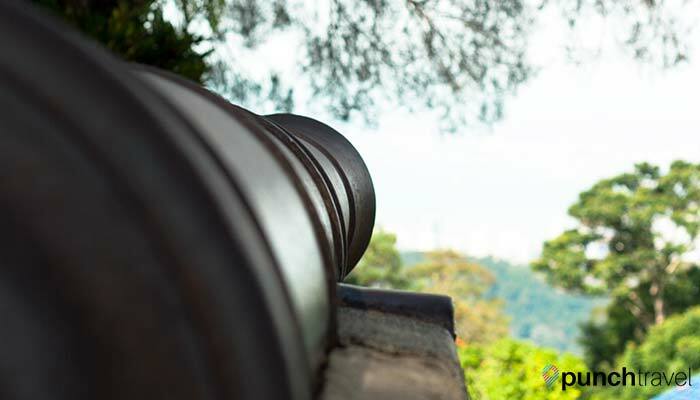 If you can muster up the will to hike 5 km from the Botanical Gardens, or the cash to take a taxi, it may be a more comfortable alternative to reach the top of Penang Hill.